Sheep runs, not cars, cause traffic jams 'round here. Locals call it the “fall slack” ― the moment after summer crowds have gone and before ski-happy visitors swarm the slopes. 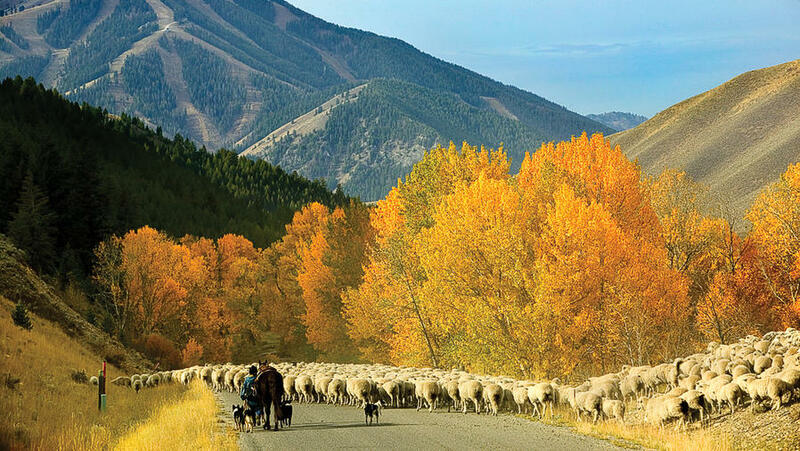 Autumn here in always-sunny Sun Valley, Idaho, 173 miles east of Boise, sees few tourists ― nor many of the moguls and multihomeowners who’ve been buzzing about America’s oldest winter resort for years. As the nearby town of Ketchum quiets, the aspens bleach the surrounding hillsides blond and form golden arches above the Big Wood River. Days are warm, nights are cool ― and rates drop at the area’s otherwise pricey hotels and restaurants. I wanted to experience the real Sun Valley during the locals’ favorite season. And I knew now was the time. Authenticity here, I hoped, included catching resident celebrities acting in ordinary ways. A recent article in the New York Times suggested Jamie Lee Curtis, Arnold Schwarzenegger, and John Kerry could all be spotted daily at the local drugstore. Maybe I could help Tom Hanks shop for toothpaste. Or better yet, discover Demi Moore’s brand of shampoo. On the perfect 70° day when I arrived, it seemed everybody was out running, biking, or walking their dog on Wood River Trails. I put on my sneakers too, hit the 22-mile paved path, and peered into the faces whizzing by: Was that Demi with the bobbing ponytail? That beefcake bicyclist didn’t have an Austrian accent, did he? I crossed a bridge over the crystal-clear Big Wood and passed the now-still chairlift for 9,150-foot-tall “Baldy.” Forested green with veins of golden grass, the ski mountain ― unbelievably ― would soon be covered in snow. My waiter at CK’s Real Food hadn’t seen any celebrities lately either. But she did serve me an outstanding meal of smoked-trout salad, lamb stew, and yummy homemade mocha ice cream. The next day, on the moderately challenging climb to pine-edged Baker Lake, I didn’t see anyone else, period. Just me and a heavy-jawed rainbow trout ― one that any fly-fisherman would call an ichthyological superstar. No autograph, though. On the drive back, I was stopped by an unusual traffic jam: more than a hundred fluffy white sheep being herded across the highway. Cars backed up in either direction, but no one seemed to mind ― it was the most mellow gridlock that’d ever caught this California girl. A man in a dusty Cadillac pulled up beside me. He had salt-and-pepper hair, a fat silver moustache, and chomped an even fatter cigar. He was, well ― it couldn’t be ― but he sure looked familiar. That got me thinking. I headed east past the Sun Valley Resort. By a shady streamside spot overlooking Proctor Mountain and the rolling green golf course was a bronze Ernest Hemingway. The plaque below his bust read Best of all he loved the fall, the leaves yellow on cottonwoods, leaves floating on trout streams, and above the hills the high blue windless skies. Here he was, my celebrity (albeit an immobile sort). And we even had something in common: I, too, love the fall best in Sun Valley.